Optional front panel with built in colour LCD screen and push button controls for adjusting settings, seeing menus and monitoring conversions. The Teranex Mini’s optional premium front panel is a must have upgrade, enabling the user to unleash the true potential of their mini converter. 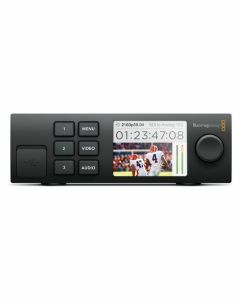 Including intuitive push buttons and a built in LCD screen for easier set up, the LCD screen also displays the video going through each of your converters. The premium front panel is ideal on set without external monitors or for field work, or even when you have multiple converters mounted in equipment racks and just want to see what’s going through them all.